Some might consider this no fun but it really doesn't mean no taste, because it's actually packed with it! 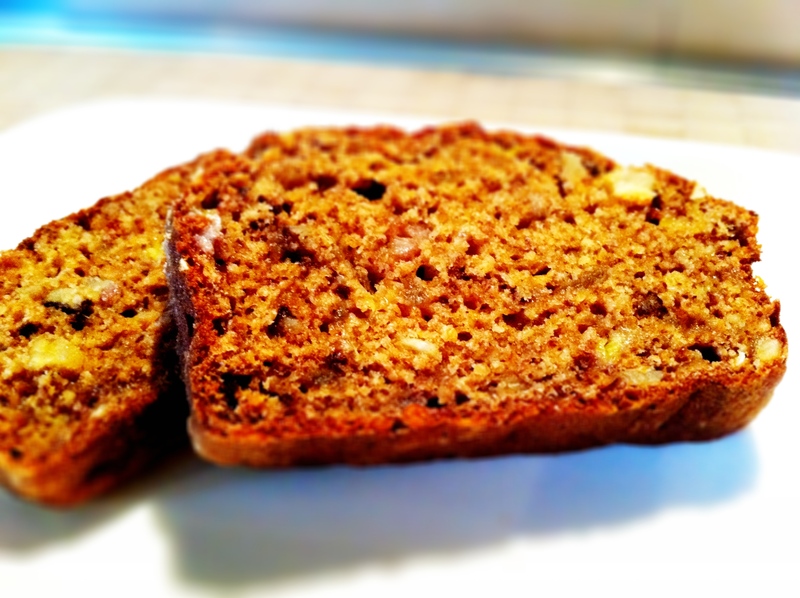 Banana bread has to be the most versatile and universally well-loved recipe ever. Every week, I’ll come across someone posting their take on a banana bread recipe. When I got back from Spain recently, my husband asked me if I could make another banana bread because we had 4 sad looking bananas that desperately needed using up. However, as I started to review my last banana bread post, he asked if I could make a healthier banana bread using some oat bran instead. So as always, I turned to the Great Oracle to look up oat bran recipes and stumbled on this one posted on Spark Recipes. As I started preparing the ingredients, I was hugely sceptical that this would work but I have managed to surprise both myself and my husband this weekend. The most obvious difference about this recipe is the complete lack of butter. I will admit that I did use a bit of butter to line my loaf tin – I’m a traditionalist and like preparing my baking trays with the age old combo of smeared butter and a dusting of flour – but other than that, I really have not used any butter at all. I have tweaked Spark Recipe’s ingredients slightly, adding more bananas, adding walnuts and making my own apple sauce, but on the whole, it’s largely unchanged. This recipe does create a slightly (but only slightly) denser cake but it is just as fragrant and moist as the banana breads we’ve eaten in the past. The banana flavour is amazing, and I love getting the occasional bite of walnut but the apple sauce purely lends sweetness rather than flavour. I thought about making a chunkier apple sauce but in the end, created a smooth one instead as i wanted to treat it as a sugar supplement instead of as a main ingredient. Now I am a complete butter fiend, and while I still love my regular banana breads, this healthier alternative really does hit the spot. Only problem is, because my husband feels it’s healthier, he’s already eaten three slices today… oops. Click here for a printer-friendlier recipe. 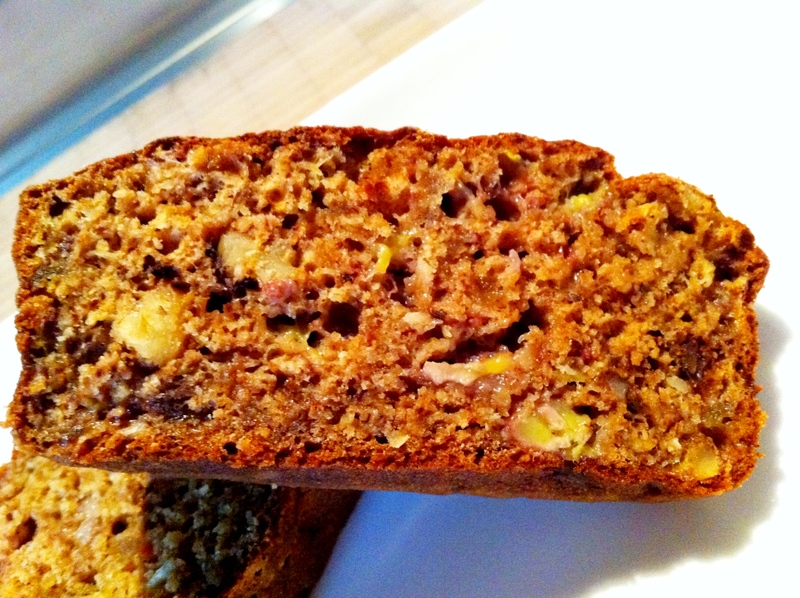 Butter-free banana, apple and walnut bread. Preheat your oven to 175 degrees (Celsius). In a large mixing bowl, add all your dry ingredients and nuts. In a small saucepan, heat/make some apple sauce and melt your brown sugar into the apple sauce. Pour your sugared apple sauce into your flour/spice mixture, add the mashed bananas and mix well. Pour into your loaf tin and bake for 40-45 minutes until a skewer comes our clean. Today's lesson was realising healthier food can taste just as nice. Phew! Yummy, Noodle! 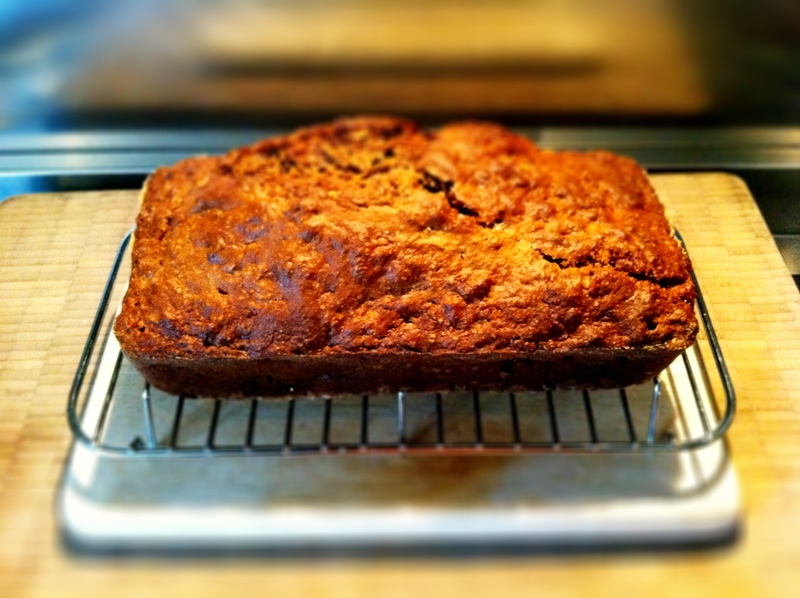 I adore banana bread, as you may know. Healthy cake can often be just as good as normal cake, if done right. I often feel like banana bread doesn’t need butter anyway since the bananas lend so much texture and consistency anyway – great stuff! Leaving the butter out of the recipe just allows you to slather more on the toasted bread. That’s what I’d do, anyway. I love baking, but I have to pick my recipes carefully because of all the butter involved. This butter-free version looks delicious! I’m madly in love with butter, but I also adore a good banana bread recipe, and this looks perfectly lovely even without the magic of butter. Well done!